The VWR Digital Dry Block Heater provides versatility, and repeatable results with exceptional accuracy and temperature uniformity. This dry block heater is an ideal choice for a wide range of laboratory procedures, including melting/boiling points, immunoassays, blood urea nitrogen determinations, enzyme reactions, as well as the incubation and activation of cultures. The VWR Digital Dry Block Heater reaches temperatures of up to 120°C (284°F), and displays both the actual and set point temperature on a bright easy to read LED screen. Users may control temperature settings in ±0.1°C increments. Temperatures on this heat block are controlled through a microprocessor, with a stability of 0.1°C, and timed sessions may be set. Elapsed time, or count downs are displayed on the front panel with an alarm when time is reached. 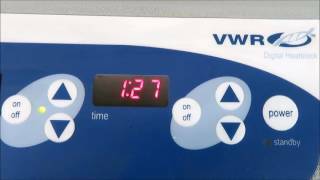 This VWR Digital Dry Block Heater has been tested to maximum temperature with our calibrated thermometer and preformed as expected. If you have any questions, please don't hesitate to contact us.